Because warm weather is best enjoyed al fresco. Having patio space is something most city dwellers only dream of, but for lucky homeowners with a bit of land—or a postage stamp-sized yard, like Whitney Leigh Morris (check out her dreamy petite patio here)—it’s an opportunity to create a whole new room, one with super comfy furniture and weather-proof decor. 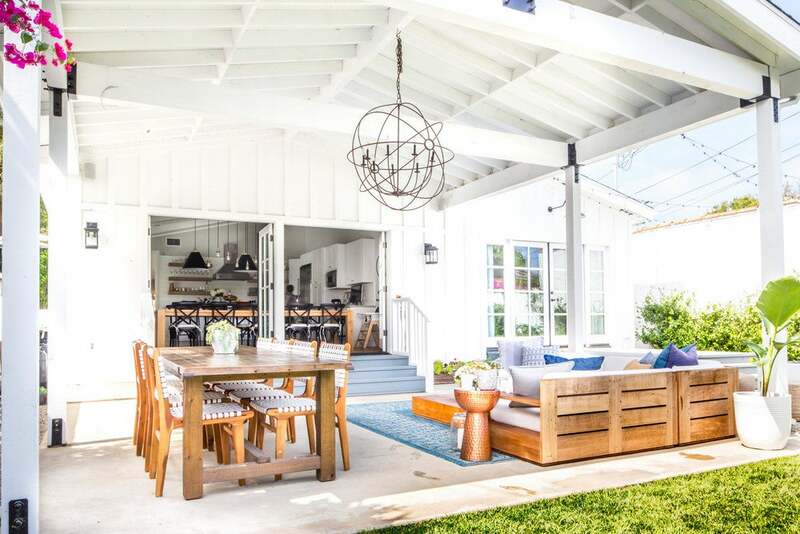 Whether you plan to lounge by the pool, share meals with family and friends, or just want a cozy space to hang out, we have inspiration for your outdoor space—and lots of it. Designer Margot Elena’s peaceful Colorado home is blessed with a sprawling landscape, big enough to create multiple different areas, including a gravel-covered patio with a fire pit and a few old tree stumps for seating. The pool situation at this serene Malibu home is what summer dreams are made of. Emulate the look with plush, soft white cushions and simple wood furniture. For the patio at their Mar Vista home, this couple was heavily inspired by their California surroundings and sought to create an indoor-outdoor vibe enabled by the home’s open floor plan and the patio furniture that doesn’t really look like patio furniture. Terracotta planters make for quite the eye-catching centerpiece for the outdoor table. This pared down look may come with a limited color scheme, but the earthy accents help elevate the overall decor. Create an impromptu setup outdoors with a folding table and chairs. We couldn’t think of a better spot for our morning coffee. An eye-catching rug helps designate the outdoor seating area, providing a focal element to the myriad furnishings. Bench seating and pattern tiles are all a compact outdoor patio really needs to feel like its own unique and functional space. See the entire home here. Sometimes less is more—right? Place a bench beneath a tree and cover it with a sheepskin for the perfect outdoor reading nook. This dark paint choice for the fence also adds depth to a small space. Aside from the typical patio decor, we’re all for a comfy landing pad that’s perfect for catching a bit of sun. Stark white patio furnishings instill a elegantly modernized feel to the refined patio setup, helping combine the various materials and finishes of the area. An outdoor patio design scheme that complements the exterior of the home is always a win in our book. When decorating with an exclusively black and white theme, integrate a metal into the mix – the steel planters in this case – for a more defined finish. Mix and match your furniture to create the ultimate patio look. We especially love the use of color on this outdoor dining table! This patio really makes the most of a small space… And gets bonus points for the candles in the fire place and wall of greenery. In lieu of the typical outdoor coffee table, opt for a rattan pouf or a pair of garden stools instead. Bring in a table that’s greater in height and couple the look with an eclectic mix of bar stools and chairs! This just may be our dream spot for summer. Pair an outdoor daybed or lengthy seat with a cushion and plenty of pillows to create a spot that’s perfect for everything from reading to entertaining. Aside from the typical patio furnishings, create a comfortable seating spot on the floor. Layer the slightly enclosed space with a worldly landing pad and complementary cushions, and pair with compact coffee tables of an appropriate height. Bring the subway tile trend to the outdoors! We’re loving the dual-toned seat paired with the softness of the maple wood coffee table. Make the most of a tiny patio area by planting a ton of greenery — the gorgeous plants will make you feel as though you’ve escaped the concrete jungle. Is there anything better than a boho inspired outdoor spot? Create a seating area out of a few reclaimed wood pallets and cover with a plethora of cushions and fluffy pillows. This post was originally published on April 20, 2016. It has been updated with new information.